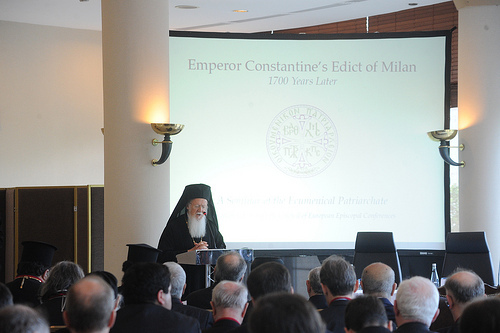 We too, echo the words of the Psalmist, beloved brothers and concelebrants in the risen Lord, representatives of the Holy Orthodox Churches throughout the world, brothers in Christ from other Christian Churches, distinguished and esteemed seminar participants. We are delighted to have you with us in our city, in the courtyard of grace and history, the truth of faith and the experience of wonder, in this sacred place of our glorious Lord, who suffered, was crucified, buried and rose from the dead for our salvation. This seminar, whose deliberations we now proclaim open in Christ’s name, marks the turning of a new page. It is not simply a new record, but a new reality. Sadly, for many people, it is the pages of ephemeral reality that provide the record of history. Nonetheless, we who are of Christ – through whom and by whom and for whom all things came into existence, in periods of persecution and sorrow for the truth, up until 1700 years ago, with the declaration of the renowned Edict of Milan by Constantine the Great, through whom freedom was granted to the Church for worshipping the Lord and publicly confessing our faith in Him as the only true God and Savior – record history through the presence of God in various times and periods as well as in diverse ways and forms in the worldly arena. These pages of history are certainly influenced by human freedom but ultimately defined by the Lord of life and death. The anniversary that we are celebrating and honoring provides occasion for us to ruminate on these events, considering and reflecting on the development of the contemporary world 1700 years after the divinely-inspired Emperor established in action and legislation the fundamental principles, on which modern Christian societies – and by extension and analogy, the entire world – are based to this day. In our time, we observe various nations and countries mimicking one another, especially in this age of so-called “globalization,” when the velocity and quantity of information and misinformation, of truth and fabrication – to the point of distortion for some trivial or ephemeral “interest” in events as well as the relentless slander of people and circumstances – of justice and injustice, are broadcast “in a split second” throughout the world; we observe a tendency for all things to be permeated by only a secular spirit. We sadly ascertain as contemporary human beings, and particularly those of us “called to a sacred vocation,” another reality, beyond the expected and surely desirable “good transformation.” More specifically, traditions are increasingly abandoned; faith is regarded as an individual affair and people endeavor to marginalize it within society; ideals and values – namely, the forces which have constituted and conserved nations through the centuries – are scorned; education is assaulted and secularized; legislation is estranged from its religious basis, which always – and especially from the time of Constantine to this day – comprised the theoretical foundation of all law; sin is no longer conceived as “evil” and adopts the garment of variation, that is to say merely of personal choice; immorality is accompanied and concealed by the scornful pretext or complex of fleshly weakness, while the morality of Christ is trivialized; in other words, people overlook the penitential cry: “Lord, have mercy,” which is the very content of faith and life. Despite this disappointing development in human affairs, which is all the more apparent in the secularized Western society and civilization, the same Western world retains – in its heart and mind, as well as in its fabric and structure, its governance and legislation, its arts and values – the ethos and spirit of the Church, of Constantine the Great, and of the Gospel. Whatever good and righteous remains in today’s secularized society in fact derives from the Gospel and the Church. The basic human rights, for which all peoples and societies strive, but which are frequently perceived in a sense of retribution that does not resemble the spirit of the Gospel or Christianity (“an eye for an eye, and a tooth for a tooth”), comprise spiritual values, which the Emperor Constantine planted within the governance and structure of his empire because he discerned and predicted that this was the only way of securing progress and preserving peace. It is essentially the same values that the modern world has inherited, except that the titles have been altered, while humanity now formally declares that it does not believe in God and the hour of Christianity has passed. Despite frequent and dangerous reformations, which sometimes destroy the very foundations of society, such as a lack of respect for the sacred institution of family and marriage, the legal recognition and regulation of serious mortal sins or unnatural conditions (see Rom. 1:25-32), contemporary state institutions are deeply permeated by the Gospel of Jesus Christ and the blood of the Church Martyrs. Constantine the Great colored his empire with the dye of Christ in order that this might not be extinguished with the passing of time. Have we ever asked ourselves why? We judge one another, yet we ignore the words of Christ: “Do not judge in order that you not be judged.” We believe that, in our human frailty, everything comes and goes and is forgotten, although we know that God “sees all things” and “rules hearts and minds.” All things human are vain (St. John of Damascus); indeed, “the present pleasures resemble the flow of a river, shadow and smoke, a dream and blade of grass.” (St. Andrew of Crete) Nonetheless, the dye of Truth is “stronger than death.” Moreover, the dye of Christ through Constantine the Great could not be permanent unless it was preceded by the dye of “the indelible ink” of this sacred City and the whole world through the blood of the countless and great holy Martyrs, many of whom lived anonymously “in mountains and caves and the holes of the earth” (Heb. 11:38), as well as on cemetery gravestones, but also the countless and great heroes of the faith, through whose sacrifice the Church increases and is nurtured, reconciled and stabilized. The blood of the Martyrs, their cross and sacrifice; the renunciation of the world and of the things of the world; the notion of solidarity and friendship (according to the words of Christ: “I have called you friends, because I have made known to you everything that I have heard from the Father” [John 15:15]); the love that “casts out [every] fear” (1 John 4:18) and especially the fear of death; all these things brought peace to the Church, which was in turn visibly and tangibly articulated in the Edict of Milan. The suffering of the holy Martyrs and of those unjustly assaulted through the centuries to this day, all of which were modeled after the martyrdom of Jesus Christ Himself, who was covered with myrrh and who suffered for us “in order that we may follow in His footsteps” (1 Peter 2:22); these same sufferings of the Martyrs also granted to the Church mercy, salvation, peace after three centuries of horrible persecutions. The Orthodox Church is perfected in suffering, through the martyrdom of its children, who reveal the sincerity of their love for God precisely through suffering. Thus, the blood of the Martyrs comes first and the freedom to worship, which was proclaimed by Constantine the Great, follows. The suffering of the holy Apostles comes first and the rights provided by the emperors follow. The tears of the holy myrrh-bearing women come first and the absurdity of the Resurrection follows. The Lord invites St. Paul, the Apostle to the Gentiles, in order to warn him “about all the things that he would suffer in His name” (Acts 9:16), while St. Constantine is called by the triumphant and brilliant sign of the precious cross. When Constantine the Great encountered in the “Italian” skies the precious cross shining, he was transformed. And together with him, the entire world of the Empire and of humanity was also transformed. This tangible vision of the ever-present sign of the cross, silently and constantly calling him, is similar to the sign witnessed by St. Paul, the Apostle to the Gentiles, on his way to Damascus, “so that if he found any belonging to the Way, men or women, he might bring them bound to Jerusalem.” (Acts 9:2) Can it not also be said about us, that we too “persecute” those who hold views contrary to ours, whom we simply endure and tolerate, wishing that they would be “bound” to the cross – although not the cross of Jesus Christ, which would be desirable for their and our salvation, but rather the cross of our human weakness and evil? Saul the persecutor was converted into the most zealous disciple of Christ and transformed the whole world through his preaching. Through the vision by daylight of the sign of the cross, the Emperor Constantine reformed the entire world. Not only did he put an end to the unjust persecutions against the Church and humanity as the image of God in the world; but his actions managed to attract the Christian doctrines and Gospel commandments into the ideology and lifestyle of the empire and the world, thereby introducing a profound division into world history without either planning or striving for it. So he did not receive his calling from below; nonetheless, behold, he was proclaimed an Apostle among emperors. A human paradox; yet, a divine gift. In order to believe, human beings always require a sign. (Matt. 16:4) However, we ignore the fact that we shall not receive any sign, except the sign alone of Jonah the Prophet, who survived in the belly of the beast and foreshadowed the resurrection. In this sign, which shines more brightly than the sun, we are able to see and celebrate. And we should never forget that every sign is given as a gift, received and never planned; it is a calling, charisma, grace, mercy, commission, and constant journey. It is noteworthy that the former kingdom of corruption, in the secular rule “of Augustus who was monarch of the world,” received the infant Jesus with the slaughter of thousands of innocent infants. While, from the incarnation of the Lord, “deceit is overcome” and divine grace, love and justice reign, we cannot say with conviction that, despite human progress, everything under the sun has been transformed. Today, two thousand years after the incarnation of Christ and the murder of Herod, who thought of himself as “universal ruler,” unfortunately the murder of thousands of infants is legally recognized in most “Christian” countries. Constantine the Emperor rejected the “right” to claiming the status of a god, to which he was entitled by his office and the ideology of his time. Nevertheless, he gained the One who alone is necessary (Luke 10:42) and inherited the kingdom of God. We find ourselves in the city of Constantine. And we are justifiably exploring the condition today of the most Christian of cities, which was established and honored by Constantine the Great with his own name. Yet, the historical page and sign witnessed 1700 years ago overcomes any pessimistic and negative consideration. For the fact is that the Church contains the entire world through the cross; the fact is that faith is not a social phenomenon or mere ideology It is the sanctifying grace, which descends upon us and visits us eternally and silently, accompanying us like “fire,” “a gentle breeze,” something “unknown among known and unknown,” something discernible among those who obey God’s will but also recognizable among those who disobey his commandments, something that comforts the fearful disciples in the upper room of Jerusalem and the doubtful disciples of all ages – namely, the abiding grace of the risen Lord, Father, Son, and Holy Spirit. Christians “find themselves protected in the world, yet at the same time holding the world together. (Epistle to Diognetus 6 PG 2. 1176) This is why we Christians are not dragged down and do not despair. We know that people make mistakes in their judgments, thoughts, programs, ideologies and considerations. However, the Church does not; the Church is not abolished, even when Christian nations are dissolved, even when the Church lives and exists in (sometimes harsh) captivity, even when the Church is persecuted. The Church is in the world and serves the world, but it is not controlled by the world, which is the reason why evil does not affect it. The spirit conquers the flesh. Christ reigns forever. The Lord is victorious over all. In the inscrutable will of the Lord, which has deemed us worthy of being “laborers in His vineyard” and of continuing the work of the Apostles and Hierarchs, we are invited in His name, without human plans and programs that are foiled on a daily basis, to labor for the transformation and reformation of society, whether in a smaller or larger community, while also advancing and converting ourselves into sons and daughters of the light of Christ. It is true that contemporary social structures sometimes unfortunately distract us – and especially us as shepherds of Christ’s flock, and those of us inside His divine care – to a sense of pessimism due to the state of the world, which is alienated from the source of life. As a result, our passion is diminished and our heart is weakened in our love for Christ. Yet, we believe that the grace of our Lord Jesus Christ, and the love of God the Father, and the communion of the Holy Spirit, will never abandon us. The Lord celebrates our life mystically, profoundly and sacredly, invisibly transforming us. With these thoughts, then, we declare open the deliberations of this seminar and beseech the Lord to grant us all, to our churches and our religious communities, and to the whole world a sign for our good so that we may record new pages of history and service in order that He may be magnified and honored, through the intercessions of the Lady of angels, the Martyrs and the great pillars of our faith and history, such as Constantine the Great and Basil the Great, while, through the work of the Church, Christ may be glorified as our resurrection and life. Amen.